Well it's the last recipe in Zucchini Week, and this one takes the cake! I recently hosted an event at my house and needed a cake to serve my guests. 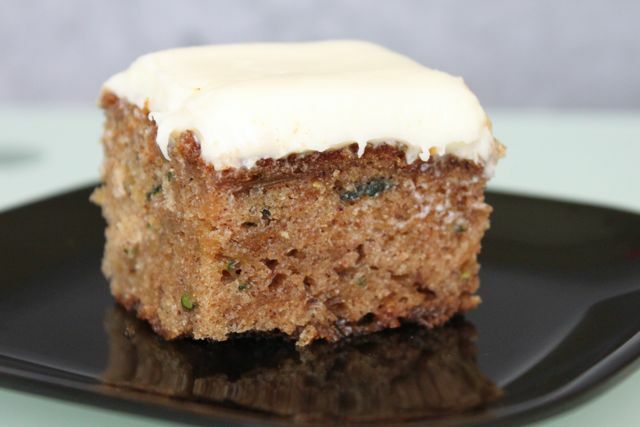 All those zucchinis were staring at me so I decided to look for a zucchini cake recipe. I loved the lemon rosemary zucchini muffins so I decided to hit up Simply Recipes again. This cake reminded me so much of a carrot cake but just with zucchini instead. In fact the recipe is very close to my carrot cake recipe. Anyway, here is the recipe for zucchini cake. I used Jen from Beantown Baker's recipe for Cream Cheese Frosting. My guests loved the cake and they didn't even notice the zucchini was in there. Since there is zucchini in the cake it totally counts as a vegetable, right? Thanks for tuning into Zucchini Week!